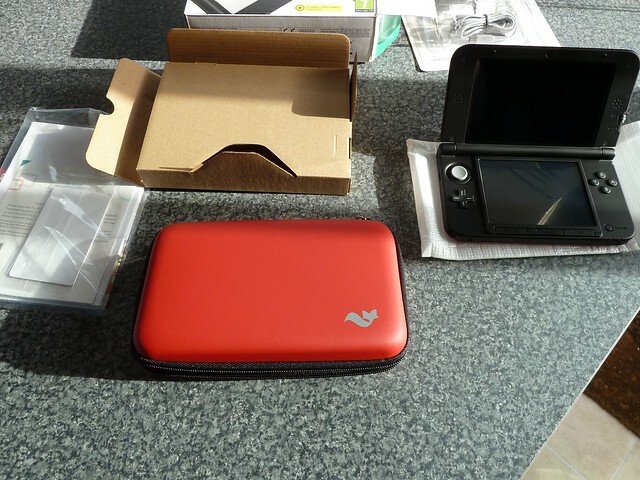 For some reason, the 3DS didn’t really bother me, granted I was intrigued at ‘glasses free’ 3D when I saw it announced way back at E3 2010, but unlike more gaming gadgets, I didn’t go for a day one purchase. 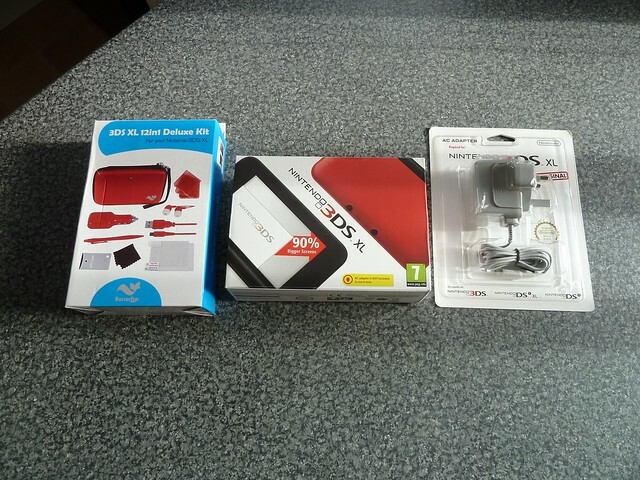 Roll on a year, and the announcement of the 3DS XL, again I wasn’t too bothered, to be honest I have a DSLite and a Wii and can’t remember the last time I switched either of them on. 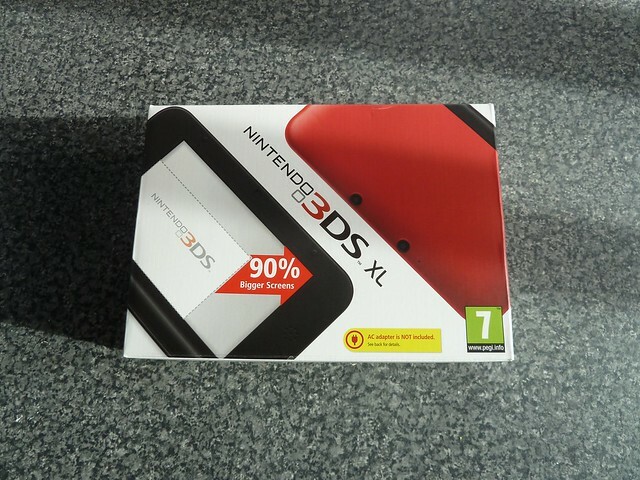 Then a couple of weeks ago more and more of the midlifegamer community started to buy 3DS’s and exchange friends codes , I suddenly got the urge to buy one, and unfortunately when I get the urge to buy something, it tends to be on the forefront of my mind until I actually buy it. 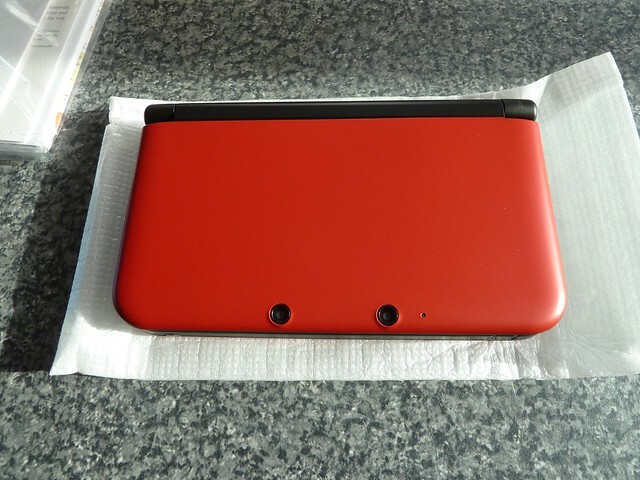 I then listened to an episode of the midlifegamer podcast, on which one of the hosts discussed the fun time he was having with his new 3DS XL and I was sold and ordered one. Now the stupid thing is, I’m about to embark on a year long challenge where I’m not allowed to buy a game, which is quite honestly going to be hell. As you can imagine, deciding which platform to buy for when it comes to Birthdays and Christmas is going to be a hard decision. Ok, so history over, and today it turned up. 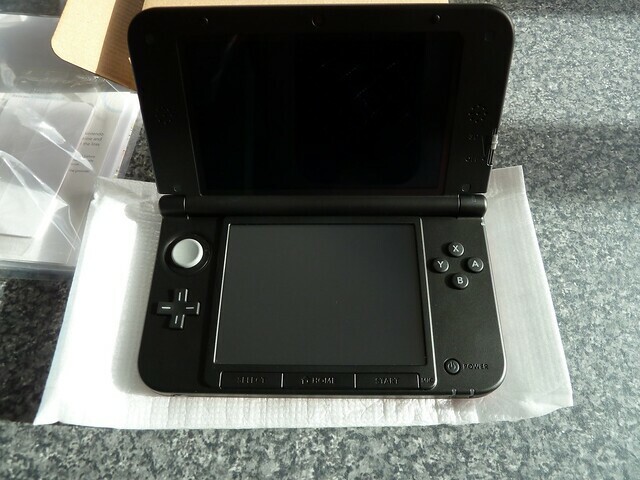 The first thing to note is this is huge in comparison to my old DSLite, however wasn’t really shocked as this apparently has a 90% bigger screen. For some reason I went for the Red and Black version, it just seemed to look better, I one point I did have the Blue one in my basket, but changed. My previous experience of the Nintendo handheld interface was on the DSLite, and lets be honest it was rather basic, so seeing this new shiny UI was a sight for sore eyes. Still to this day, I think the Wii has the best user experiences on all the current generation consoles, it’s clean, easy to use and very user friendly, and Nintendo have brought that to the 3DS XL (I’m assuming the 3DS also). One thing that I really like about the software is the ‘Activity Log’. Somebody who used Google Latitude and Foursquare to track my real world movements, and 5 different gaming sites to track my gaming time and achievements/trophies….being able to track the time I use the device gave me a happy little twinge. The console has a couple of camera, a front facing, and 2 at the rear to allow you to take 3D pictures and up to 10 minutes worth of video in 3D. I’ve had a quick play, and actually quite like what I’m seeing. My assumption is that these can only be played back on another 3DS, but I’m sure Google will be my friend. With the 3DS there are a handful of augmented reality games that use the camera, which are ok. I got something similar with the PSVita, I played them all once then didn’t really go back to them either. As expected with a newer handheld, the Nintendo store is available for you to download some old school titles, which is good if you want to go back to the GameBoy slot has been removed. 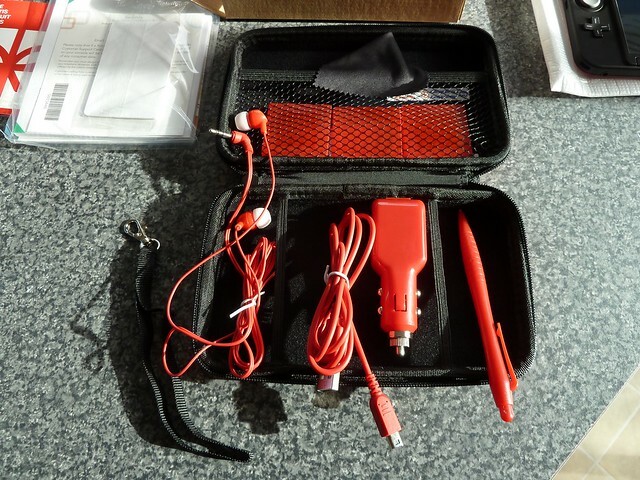 I did however have this slot available on my DSLite and never used it. Now the fun stuff, (and how Sony should have done it instead of using the terrible ‘Near’ service), when you fire up the 3DS, you’re asked to create your Mii, very much like you do on the Wii. Once created this becomes your avatar, which I’m assuming can/will be used in games, however the cool bit is this avatar represents you in the StreetPass. I’ve not been out and about with it yet, but from what I understand, if I’ve got my 3DS with me, and it’s in standby mode, and I’m in the vicinity of another 3DS, they will automatically talk to each other and offer a friends request. Again, if I understand correctly, you can only have 10 ‘friends request’ queued up, but once accepted, these will become other avatars within your games. I would like to point out that if you have a Wii, and like me you spent many evening creating Mii characters, you can transfer these to the 3DS. I currently have , Beavis and Butthead, and many random Star Trek, Star Wars, Matrix, Simpons and Red Dwarf cast members running around my Mii Plaza. Finally, the 3DS does have an integrated web browsers, which is…ok, however nowhere near as smooth or as usable as on my iPhone, so don’t really see me using it very much, it also seems to take far too long to render the pages. As it stands, I’ve not actually played a game on it, as I’ve been too busy exploring the device and setting it up, but I’ll post what I think of the games on my gaming site. All in all, a cracking device, not sure how long it’ll be before the honeymoon period wears off and it’s sat on my shelf next to my DSLite, PSP and PSVita, but so far so good. 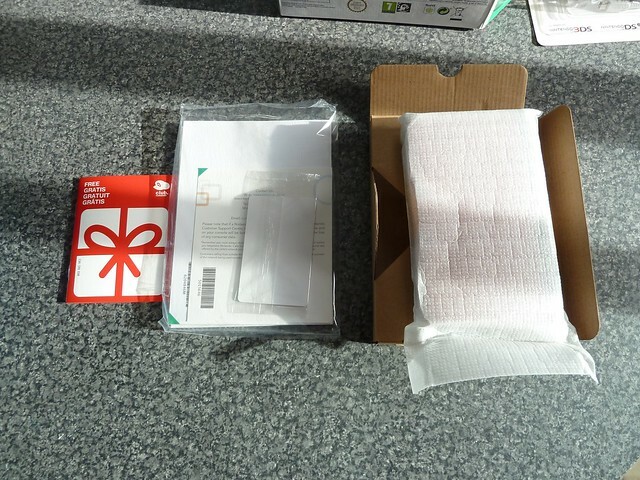 As always, unboxing pictures below, and a great unboxing and instructional video from Oli. 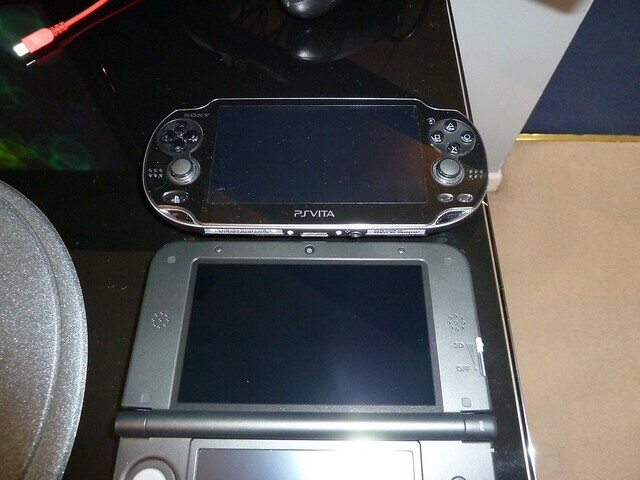 Just so you can get a size comparison, below is an image of the 3DS and PSVita together….yup, it’s huge! Being a Software Tester and a Gamer, I obviously jumped at the chance to become a beta tester for the new Xbox Dashboard. Earlier this week I got the “Time for an update” message, and knew it was time to play. As always with the Xbox updates, it just worked, took very little time and before I knew it, I was presented with the new dash, and I have to say, Microsoft have really impressed me. So, what to expect when this goes live to the public ? First screen you get is, Download a profile, Create a profile, or log in using your profile on a memory stick or hard drive. I have multiple Xboxs in the house, so tend to carry my profile and saves on a memory stick. However what I did was hit the download profile button. Within about 30 seconds it downloaded my profile from the server and plonked this on the hard drive, you are then given the option to save password….this essentially automatically logs you in when you switch on the Xbox. Once your logged in, your presented by the new dashboard. This seems a lot cleaner than the previous version as it groups the content together with a title bar above. The landing screen (at least for me) is Home, which gives you a Play <Current game in your DVD Drive>, Quickplay (the previous couple of games you’ve played), a rolling advert in the middle, and a couple of adverts down the right hand side. The left tab to this in the bing search, which I’ve tried on the the Kinect and this seems to work fine. I shouted at it “Xbox Bing Search Batman” and was presented by all the batman films, games, and any music that was available on Zune Music. I could then just say “Lego Batman”, then screens, and I could quite easily navigate through the screens with the power of my voice. The tab to the right of Home is social. Now this is where I think the major difference is. No longer do you have a massive list of friends that you have to scroll through, you only get the friends that are online and what they are playing. You can if you wish click on the friends tab and see everyone. Underneath your friends button you also have a Social Apps section, this is where you will find the likes of twitter, facebook and video kinect. Finally on the screen you have the option to Sign In or Out. Now one of the major additions is you can now see friends of friends. Clicking on any of your friends will give you the option to Send Message, Join Game, Invite to Party, Compare Games or Friends. The Friends button will show you a list of your friends friends, what they are playing and essentially everything you would expect to see if these people where in your friends list. Another feature under the Friends tab are Parties, Beacons & Activity and Add friend. Add friend and Parties explain themselves, however the Beacons & Activity is quite interesting. The centre tab is “My Activity” which give you your top 5 activities, currently at the top of mine is Skyrim, which says 2 online, and 13 recently played. Clicking on this drills you down another level and takes you to a “Your friends’ activity in this game”. Currently this lists 13 of my friends, which you can then click through to their profile. The next tab is Friends’ Activity, which gives “The games and apps your friends have been playing” and essentially a personalised top 10, with the top seeming to be Modern Warfare 3, on the Xbox, with 19 recently played. This screen is quite interesting, if I wanted to play online with my xbox friends, I know what games are hot within my gaming community. Currently the top 5 are Modern Warefare 3, Gear of War 3, Battlefield 3, Skyrim and Call of Duty Elite. The final tab in here is the My Beacons. Here you can tag a game, and highlight to your friends that you want to hook up and play online. From my understanding, if one of your friends starts playing a tagged game, they will be notified that you want to play. Beacons are also something you can set on the Xbox.com website, as this has just had a major overall to bring in line with the Metro dashboard. What they have added, and I think is an excellent feature is a more verbose notification system. Previously if I fired up a game that others were playing, it would say “Friends playing this game”, now it tells you how many friends are playing this game. Also, if friends start playing a game you are playing, you will get a notification saying <friends names> has started playing <your game>, which I think will be brilliant for people wanting to hook up and play multiplayer games. The next 3 screen Video, Games, Music all work similar to the current dashboard, but redesigned to the new format. The next screen, Apps, intrigues me, and not sure where they’re going to go with it. Currently in the beta this had Sky, ZuneVideo, ZuneMusic, Last.fm, Facebook and Halo Waypoint (as I have these all installed. There is a My Apps “folder” that contains Media Center, Picture Viewer, View Player, Music Player and Sky. The next “folder” is the one that intrigues me.. “Apps Marketplace”. Currently all this has in it is “Social”, and takes you to the Social tab, however this could get interesting if they start to add more apps. The next tab is Pre-release, which currently has Green Preview, Latest Info, New Features, Help and Tips, which essentially give you a text dump to the screen. The Green Preview however doesn’t seem to go anywhere. The final screen is settings, and here you can find all the normal, System, Preferences, Profile, Kinect, Account, Privacy, Family and Turn Off. Now one of the major features you’ll find here is the Cloud Saves. Microsoft are kindly giving 512Mb of cloud storage to gold members. This isn’t enabled by default, you need to go into System >> Storage >> Cloud Saved Games >> Enable. Once this is done, you can select this as a storage device as you would if you were saving to a memory stick. What is seems to do is use a local cache, and then upload to the cloud in the background, I assume this as I’ve recently been playing skyrim, and after turning off the xbox, the light blinks on the front as it does when you have background downloads enabled. All in all I’m very impressed with this update, and only hope Sony copy what they’ve done with the cloud storage, instead of this ‘backup your saves at some point during the night rubbish’ that they have, this doesn’t help me having multiple consoles and wanting to move between room. One thing I will say, is I hope they give the option to buy more storage, as Skyrim and my 48 saves take up most of the 512Mb, and there is no way I can get my 2Gb of Dragon Age saves up there. Many many moons ago, I spent the best part of 3 months, ripping all my CD’s to mp3, ensuring all the meta tag info was correct, and the album artwork was present. This year, it’s time for my DVD collection. As some of you may know, I’ve recently bought an Apple TV (well 2 actually), and a 4TB Raid Storage device to store all my media. After playing around with the Apple TV, I noticed the feature of “Computers”, and how this would stream anything from my iTunes library on my MacMini. As a test, I added a few more items (as I only had the “Digital Copies” from some of my recent DVD purchases), and these streamed fine, so decided to work on ripping my entire collection. So, about a 2 months ago, I set to work using Handbrake to start ripping all my DVD’s to a “iTunes happy” format. Handbrake comes with a number of default settings, and I found using the default “Apple TV” format gave a good balance between quaility and file size. Another great feature of this default setting is that not only does it rip the 5.1 audio stream (allowing this to be played via the Apple TV), it also took the 5.1 track and down sampled this to 2 channels, allowing this to be played on any other device that can read mp4 format. So two painful month have passed, and I’ve finally ripped all my DVD movies, meta tagged them, and added them to the iTunes library on the MacMini. To get all 276 DVD Movies, and multiple TV boxsets ripped into iTunes I had 5 Macs all running Handbrake 0.94 and spent every spare moment at home switching disks as they finished. I had no problem with 95% of the disk, as they ripped first time. I did however find problems with some of the newer disks, and had to use either MacTheRipper to rip them to my hard drive, or if that didn’t work Ripit seemed to get it done. Once on my hard drive, I was able to then covert them. As you can imagine, the disks were all finishing at different times, and initially found myself checking the progress every hour or so. If a disk had finished, I then started the next disk going. After the first 50 disks or so, I decided there had to be a smarter way. After a little research, I found I could redirect the growl messages (for when the encoding was complete), to my iPhone. The software I used on my iPhone was Boxcar, this combined with a plugin for growl would then send me a push notification upon completion. I noticed after I’d ripped them all, the some of the media looks a little “jaggy” (namely the animation, and some older films), after reading the forums, people suggested turning on the Detelecine setting in the Picture setting, and this worked a treat. I did have to re-rip a handful of disks, but it was no biggy. Once I’d ripped a film, I used a piece of software called iDentify, this searches TheMovieDB, tagChimp and TheTVDB and fill in all the meta information, including chapter names (if available), actors, rating, artwork etc. I soon realised that if I named the film by it’s IMDB name, eg tt0092610, as in http://www.imdb.com/title/tt0092610/, this would allow the software to instantly find the correct film. With the TV episodes, I learnt to look on TheTVDB.com first, and made sure the episodes I was ripping matched the naming on there, eg “Battlestar Galactica (2003)”, and then adding s01e01…and continued this throughout the boxsets. The result of this was the files renamed to either the IMDB name or TVDB name. 1 slight bugbear I had, was the TV boxsets that didn’t run in order. An example of this was the run order of Star Trek TNG, on one of the disks I believe it went 108, 116, 115, 117, or something like that. This meant I had to fire up the disk, and check the episode list before ripping, so I could name the files correctly, ensuring when the meta data was applied, it was correct for that episode. All in all, a worthwhile task, I now have instant access to all my music, TV and movies from either the bedroom or front room.